In late 1938, only a few short months before the beginning of World War II, a most remarkable series of events took place in the south east of Australia. Set against a year in which white Australia had celebrated its sesquicentenary, Aboriginal leaders paused for a moment and took stock of the changing face of the world beyond their own shores. Prominent leaders including Bill Onus, Margaret Tucker, Jack Patten, William Cooper, Tom Foster, George Patten, Bill Ferguson and Bert Groves, who all played a role during the Day of Mourning conference on January 26, took time out from the important task of pushing for equality and human rights for Aboriginal people, to respond to the treatment of another persecuted people. United by bonds of blood and Country, they acted upon a motion by their group’s Elder statesman, William Cooper, in support of the Jewish people in Western Europe. Raised on the Maloga Mission Station and tutored there by Daniel Matthews, a Christian missionary, Cooper had been familiarised with the story and plight of the Jewish people at an early age. He had recognised their biblical struggle as having parallels with that of his own people and expressed a sense of kinship in that knowledge. It was an appreciation that was shared by the other leaders with whom Cooper had partnered in fighting for the rights of Australia’s First Peoples. Horrified by the events of the 9th and 10th of November 1938, in which Jewish businesses and homes were looted and destroyed and Jewish people were terrorised across Germany, Austria and parts of Czechoslovakia, Cooper found support among other Indigenous leaders in Victoria and New South Wales, willing to respond to what would come to be known as the “Kristallnacht” (Night of Crystal), or “Night of Broken Glass”. On 6 December 1938, William Cooper along with other leaders of the Melbourne based Australian Aborigines League, visited upon the German Consulate in that city and presented a petition, protesting the persecution of Jewish people during the events of the Kristallnacht. This has been an act which has gained recognition in recent years, for having been thought of as the only protest of its kind to have been made at the time, anywhere in the world. However, the fact is that William Cooper was not alone in his poignant efforts. 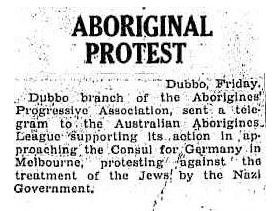 Whilst the exact timing of Jack Patten and the APA’s efforts are unknown, a report of the protest was made in disparaging fashion, by an ally of William Ferguson’s, and was printed in the Dubbo Liberal and Macquarie Gazette on 11 February 1939. The accusations made by the anonymous letter writer which were supported by William Ferguson and Jack Kinchela, were supplemented at the meeting by an attack on the Indigenous scholar David Unaipon “for his indifference to his fellow Aborigines”, and was followed up by further condemnation of Jack Patten, William Cooper and others. The latter was in response to Patten and Cooper’s efforts over a number of years, made in support of Cummeragunja, the community to which they both belonged. Patten’s efforts in particular would culminate on February 4, 1939 with the Cummeragunja Walk-Off, an event in which the bulk of the Cummeragunja community led by Patten, left their homes in protest at the treatment they were subjected to, never to return. As a result of Ferguson’s betrayal in attempting to regain control of the Aborigines Progressive Association, which he and Patten had co-founded, both his and Patten’s efforts, along with the significant contributions made by other Aboriginal leaders, in speaking out on behalf of the Jewish people in their hour of need, have been buried and all but forgotten, save for a few threads of oral tradition and a pair of recently unearthed articles published in a small country town. 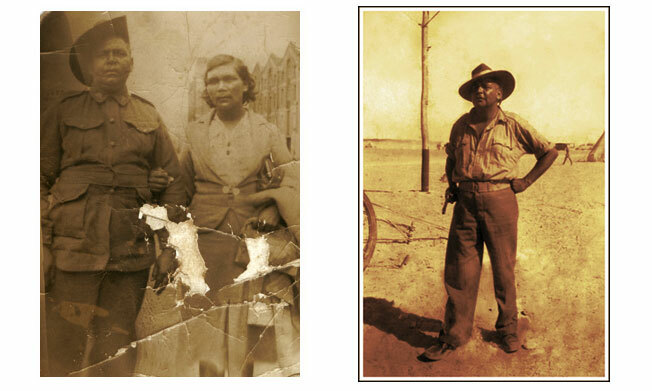 In 1940 Jack Patten’s politics and beliefs would lead him into campaigning throughout the course of the year for Aboriginal people to be able to join the fight against NAZI Germany on their own terms, by being recognised as Aboriginal men, rather than having to pretend they belonged to another ethnicity in order to enlist. With the rules relaxed partly in response to Patten’s campaign, both Jack and George Patten enlisted. In 1940 and 1941 Jack Patten served in the Middle-East as part of the 2/1 Battalion of the AIF, visiting the lands of the people he along with his contemporaries had spoken on behalf of. Next story The Dingo: A native dog?